Serving Florida and Georgia Businesses. Call on SST for planned maintenance and 24-hour emergency repairs on all types of forklifts and material handling equipment. One of our experienced, factory-trained and certified technicians will arrive in a fully-equipped mobile service van ready to work. Our goal is "first call completion" to help ensure your equipment is back up and running with minimum downtime. If your equipment needs more extensive repairs, we can transport your lift to one of our nine locations. 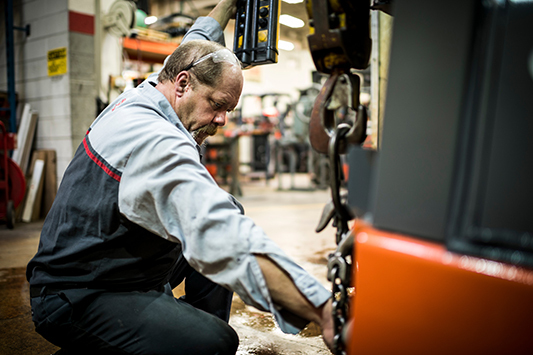 - Our forklift service department is staffed with fully trained technicians who are ready to take on your maintenance needs or complicated repairs. We are always happy to help! - With over 100 mobile field technicians and service locations throughout Florida and Georgia, we deliver a response time of 4 hours or less. 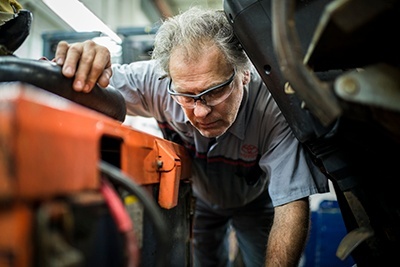 - Our technician will arrive in a well-stocked service van equipped with diagnostic equipment and parts to get you back up and running as quickly as possible. - 98% of our Planned Maintenance service work is completed within 2 hours. To request service, complete the form on this page, or call 800-226-2345 to schedule an appointment.